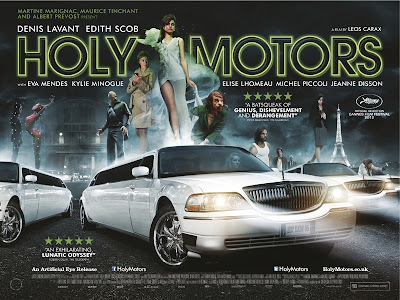 September 18th, 2012 - the UK premiere of the Leos Carax's much anticipated drama movie, Holy Motors, starring very well-known names in show business as Kylie Minogue, Eva Mendes, Denis Lavant and Édith Scob. The movie was presented at such big film festivals as: Cannes 2012, Festival Paris Cinéma, Festival Del Film Locarno and Rio Film Festival, and will now be playing in cinemas around the world. Kylie Minogue plays air hostess Eva Grace and is very excited about this movie, although some sacrifice had to be made and she had to "stop being Kylie" to "be believable as this character". Kylie said: "It's good to be acting again. It terrifies me in a completely different way and I almost had to unlearn things that I just do naturally, as being 'Kylie'. So I think I had extra work to get rid of that and to be believable as this character." P.S. Holy Motors opens in cinemas on September 28th.